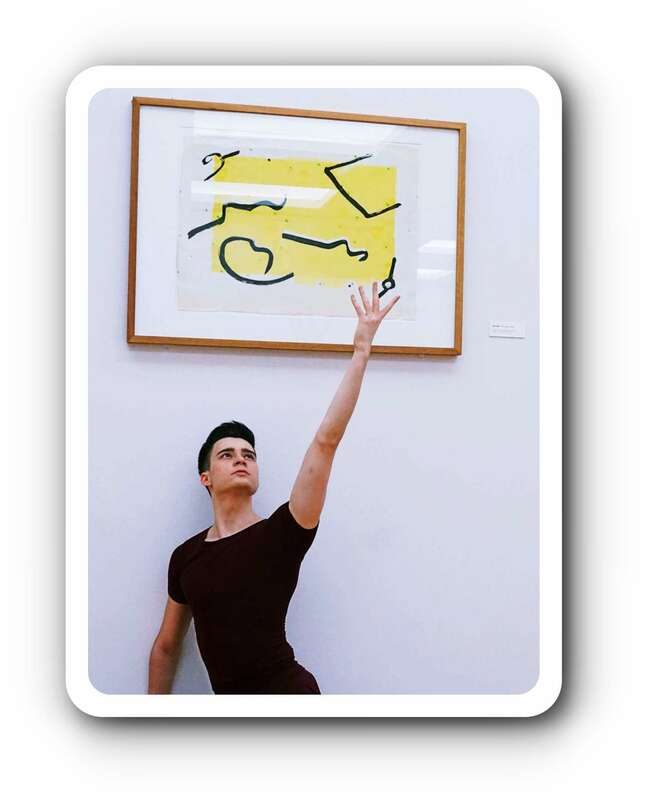 Dance and art – they have something in common. Václav Lamparter, dancing supertalent from Semperoper Ballett, has found a special way to communicate with the paintings of Dieter Goltzsche. 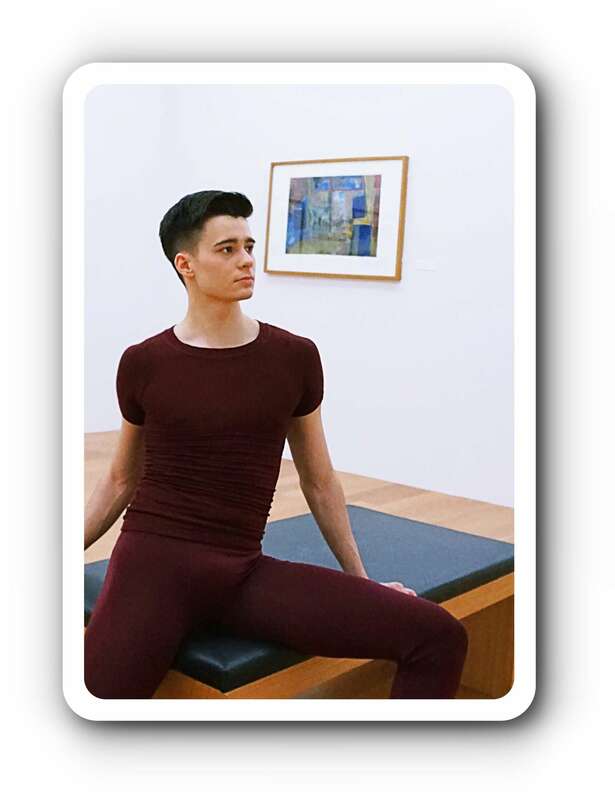 Since 2014, Václav Lamparter is ballerino in Dresden. And he is interested in the city. So he came to the Städtische Galerie and discovered this well curated exhibition „Der blaue Pfirsich“ („The blue Peach“) with Goltzsche’s paintings and drawings. The beauty of youth and the wisdom of age came together! 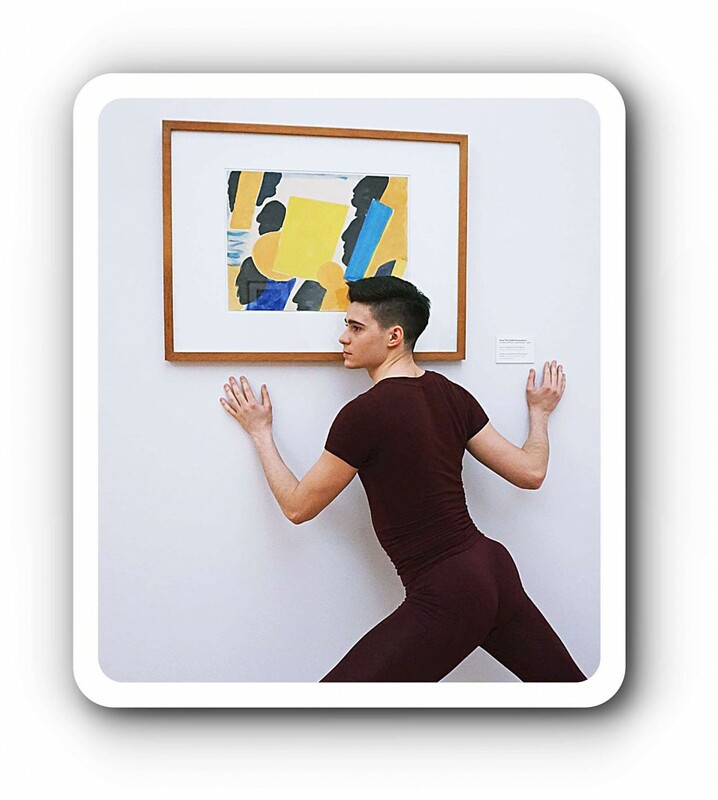 The dancer, twenty years young, was born in Brno and studied in New York; he combines an excellent technique with a very lovely, but clear style and also hot expression. The painter was born 1934 in Dresden, he studied in Berlin – and created an own method to mix up abstract and figurative lines. Nature and human civilization are his main themes. 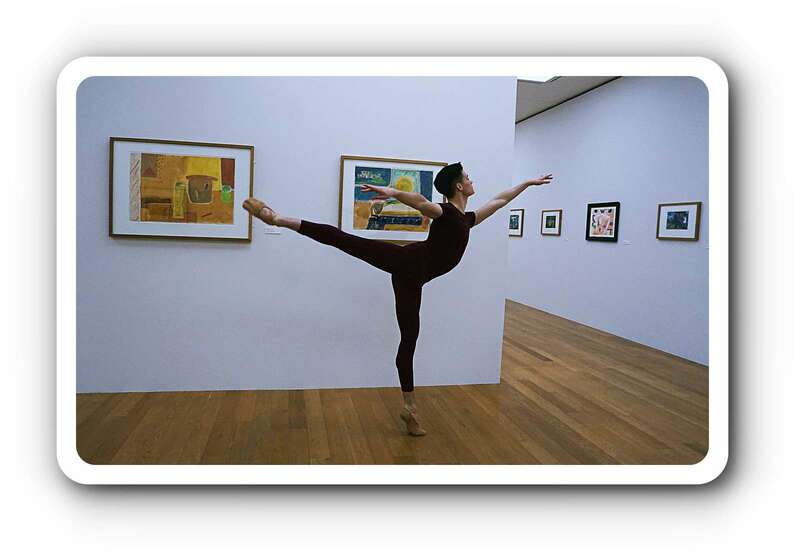 The following photos show how fine a dancer can feel in such an exhibition. 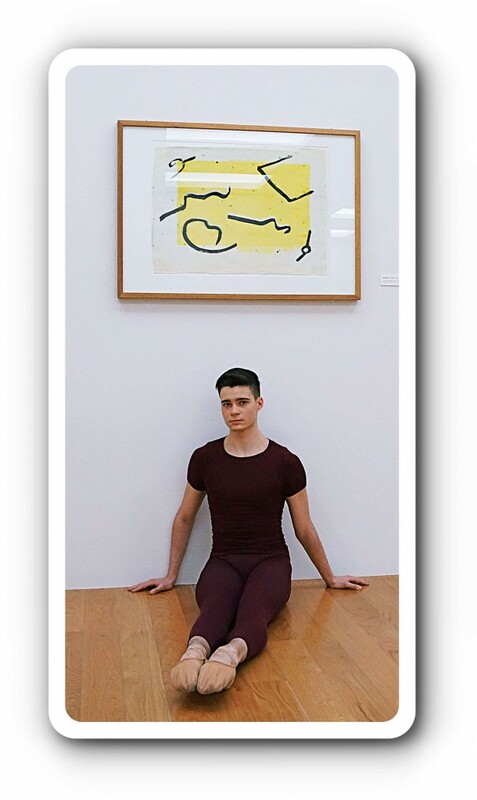 In the interview Václav Lamparter talks about his life and his work as a young dancer, as well as about his relationship to art. 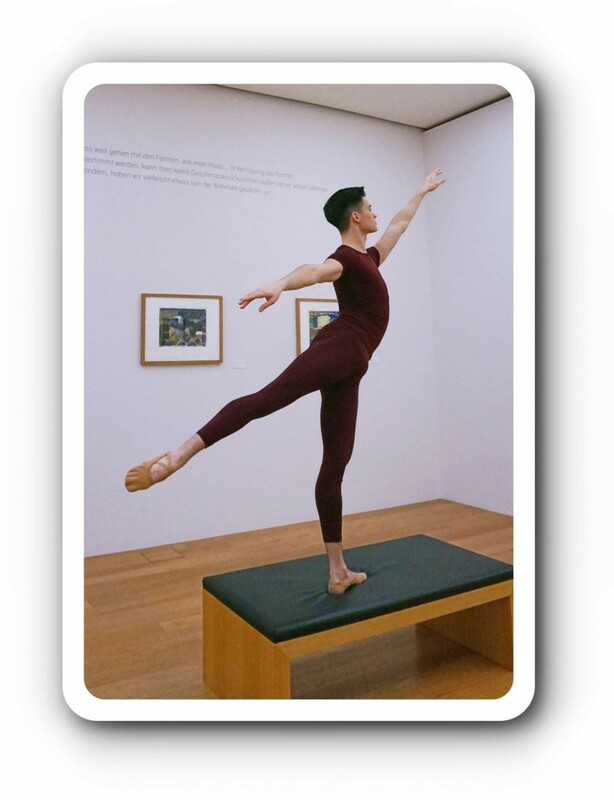 Ballett-Journal: You are dancer, but what are your experiences with museums? You like art, dont’t you? Does it mean something special in your life? 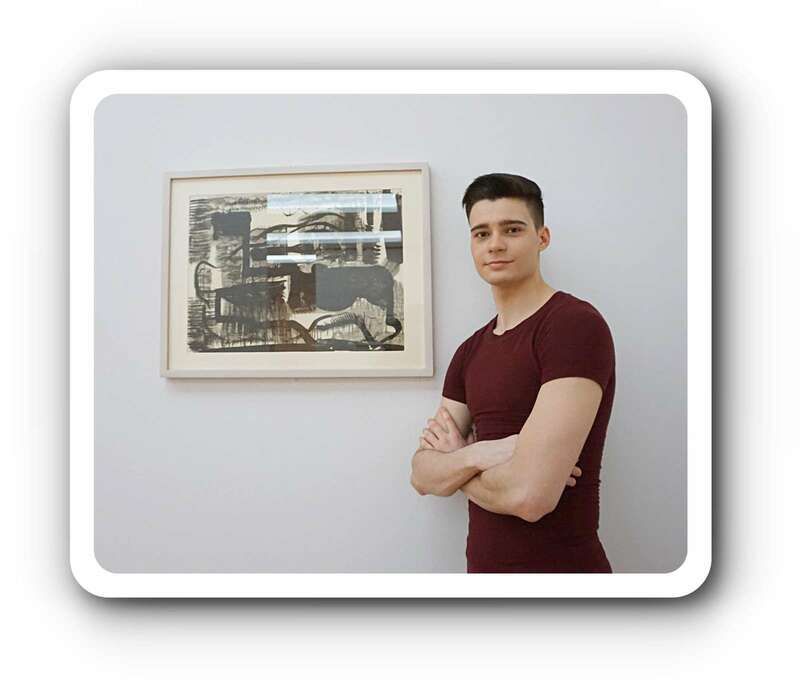 Václav Lamparter: I like art very much. Since I have spent entire days in very close touch with art in the form of dance, I also enjoy looking for art in other ways. Visiting museums is one of my favorite things to do. Here in Dresden we have a big range of museums. I like to learn about history and facts behind art expositions. 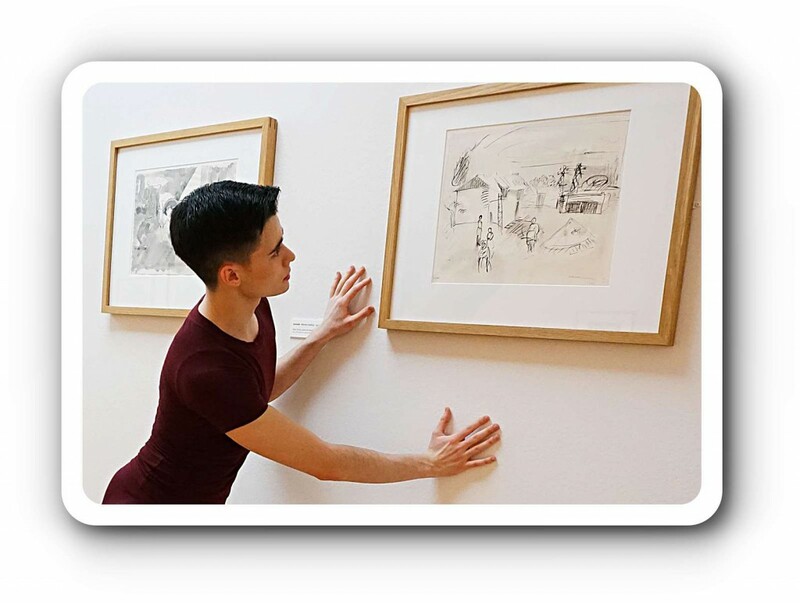 I believe that searching, observing and learning how to understand other forms of artistic work can inspire and help dancers to deepen and enrich their own artistic craft. Ballett-Journal: When you see a picture what do you think? Václav Lamparter: I try to look at the picture with a clear mind and no expectations of what to see. I observe and use my sense and imagination to create an idea or product. I think that when it is a specific picture I think more logically and when the picture is abstract I use more of my own fantasy and imagination to make a conclusion about the piece. Ballett-Journal: But you are an artist yourself, and you knew already as a child that you are. When and how did you come to dance ballet? 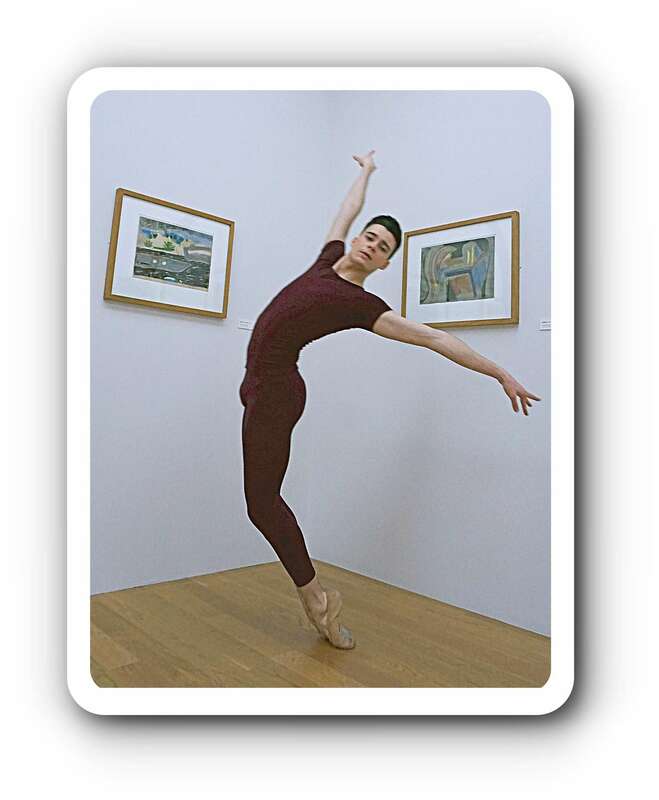 Václav Lamparter: My parents enrolled me to a ballet studio (Privat primary art school of Radmila Chmelová) that was in our neighbourhood to improve my posture and to add more physical activity to my free time. There I started to attend preparative dance course (and later basics of ballet) at age of three. Since I was six years old I also attended Ballet School of I.V.Psota (school for pre-professional students at National Theatre Brno). 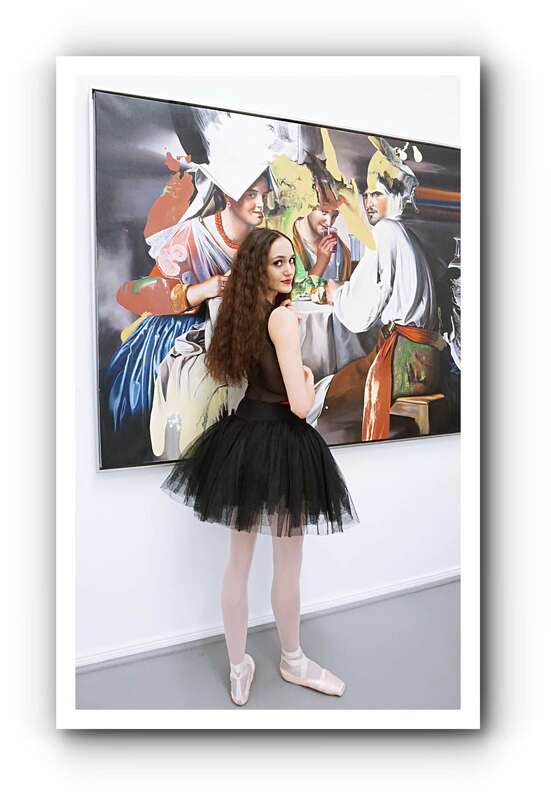 I stayed in both of the ballet schools until age of eleven when I entered Dance Conservatory Brno – a school for future professional ballet dancers. There I studied eight years artistic and academic classes and made my graduation with diplomas. Ballett-Journal: What were your feelings in the first time? Do you remember something important in the class as a child? Václav Lamparter: I remember that as a child I always liked steps and combinations that were more interesting, challenging, more elegant and bigger. That’s how I think I fell in love with ballet. I always wanted to dance something exciting accompanied by beautiful music. At the conservatory in the beginning it was hard to stay focused and motivated because we had to start from the very basics and I wished to have same kind of freedom and enjoyment that I had in former amateur schools. 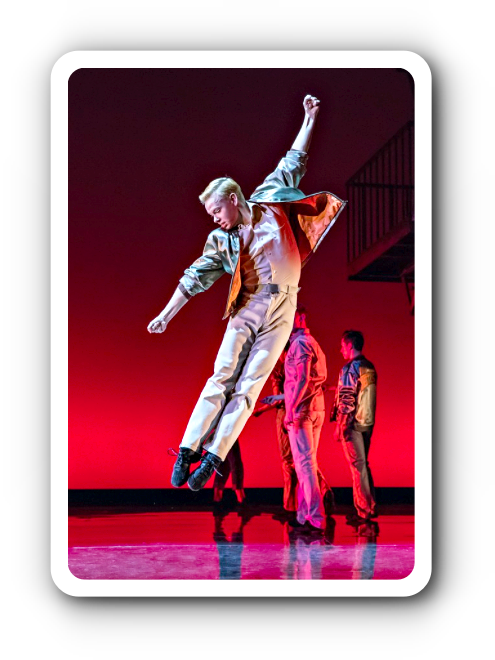 Even though I felt sometimes unfulfilled with my dancing I still remembered that this school was at the moment the only way to get to where I wanted to be – on stage. However, during the first couple of years it things changed. The classes started to be more entertaining, I got to dance more, new teachers, new classes, more performing on stage and more understanding. Soon I saw much more ballet and learned more than before. I started to watch ballet on YouTube. 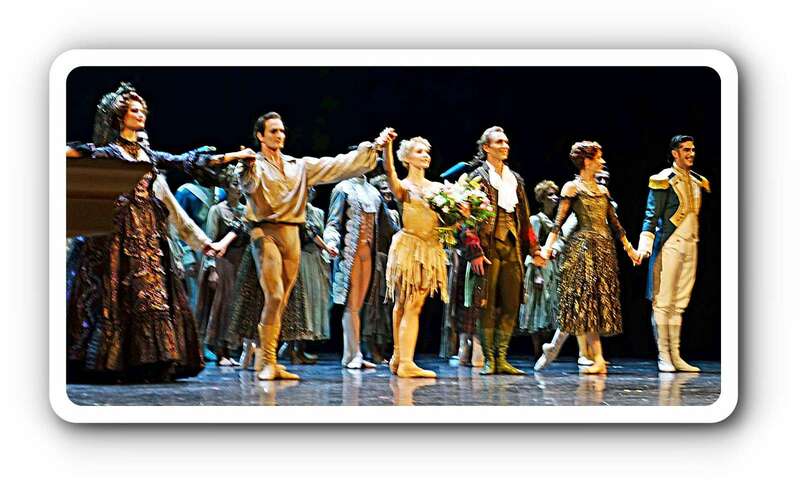 Seeing videos from Paris Opera Ballet, Royal Ballet, Mariinsky and Bolshoi among others opened an entire new world of beauty, inspiration and motivation for me. 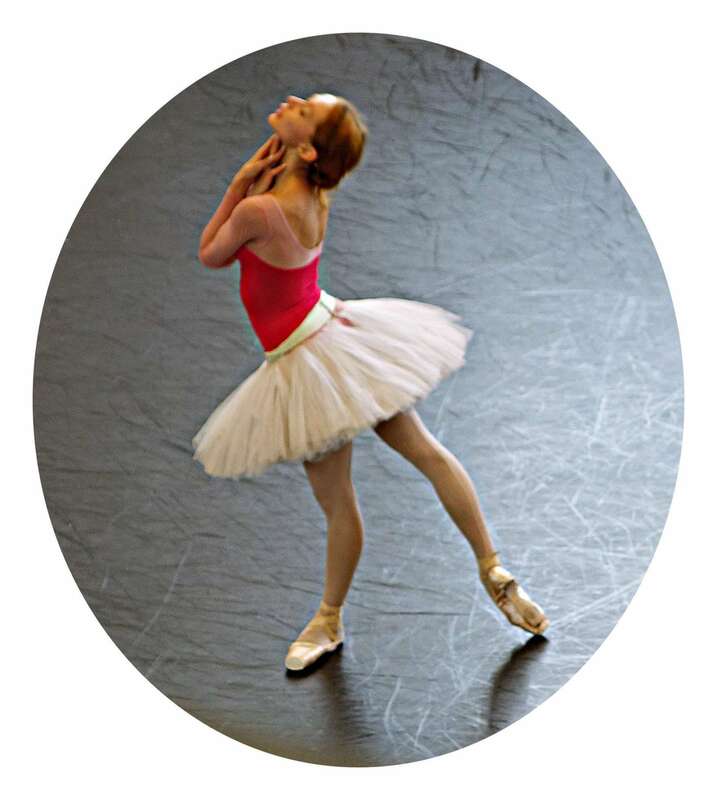 Ballett-Journal: What was your childhood like, how did it smell or taste, apart from dancing? And can you describe your family a bit? Václav Lamparter: I was born in Brno, second biggest city in Czech republic and home of my family. I am a middle child and I have two brothers who were born close to my age. I spent very nice and active childhood. Ballett-Journal: Do you have experiences with nature? Maybe as a child? Or when walking? Did you ever live on the countryside or would you like to? Or do you prefer the big city feeling? Václav Lamparter: My family has a garden with cabin at countryside so we spent pretty much every weekend there from late spring until late summer. I prefer to live in a city because there is much more culture, but I like to go to nature for vacations. I was also lucky to go nearly every summer for holidays with my family to mountains or by a sea. 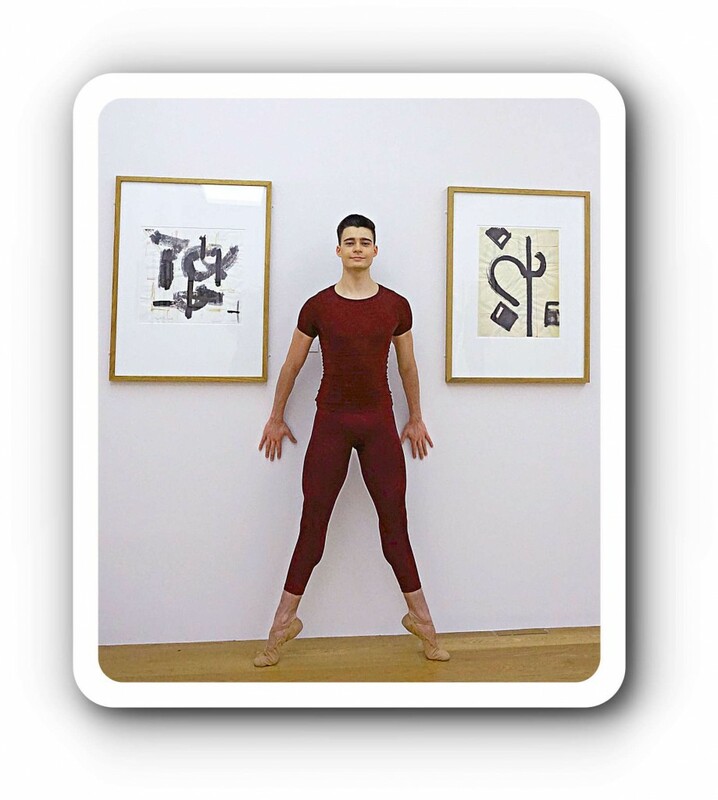 Ballett-Journal: What is the meaning of „lines“ for you? 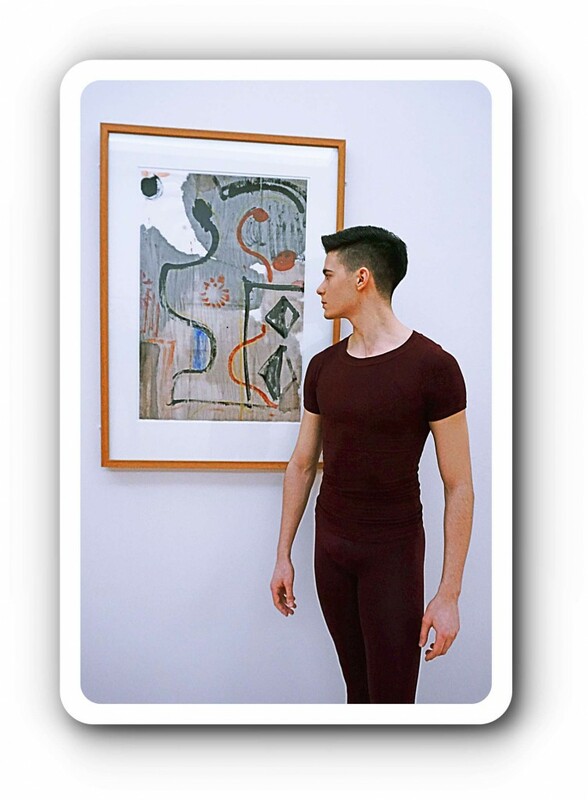 Václav Lamparter: I think that having a good lines in ballet means that dancers are completely aware of their whole body and limbs’ shapes while dancing. For me the importance of lines in dancing is evident. Nice lines make dancing look more interesting. Lines are also significantly affected by dancer’s physical proportions and abilities. Good lines make positions and transitions more elegant and in general the whole movement looks smoother and more refined for spectators. 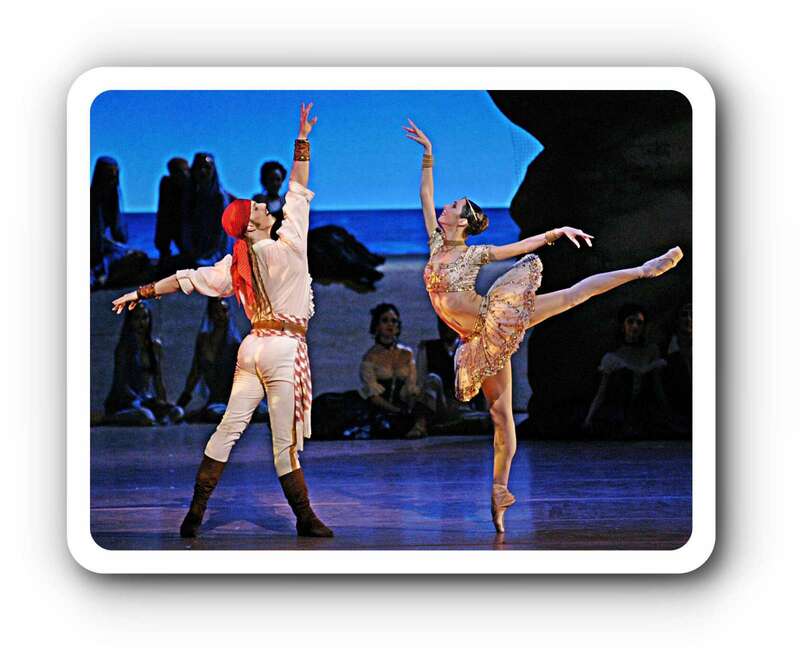 In the end that’s why I think that ballet is the most cultivated and sophisticated of all kinds of dance expressions. Ballett-Journal: When you dance, what is important for you? 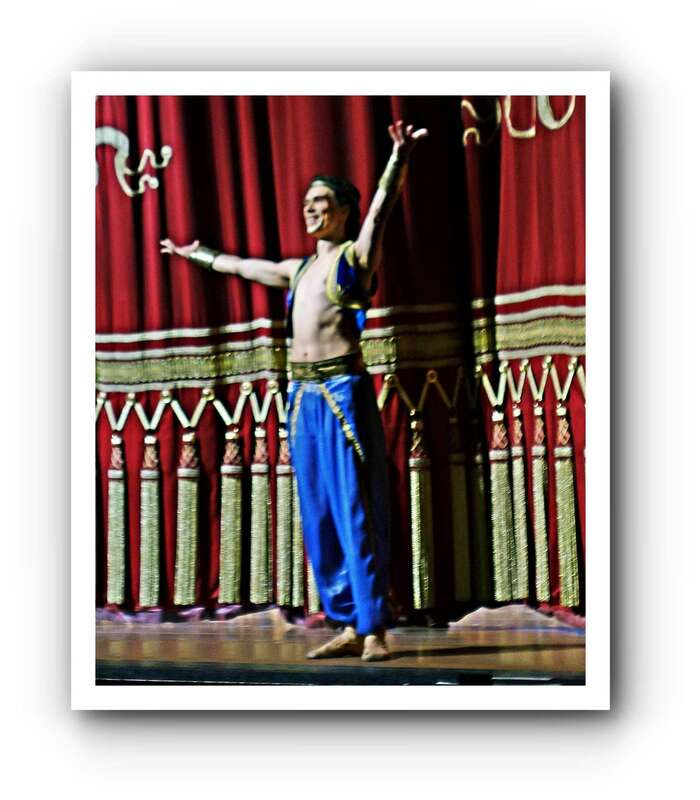 Václav Lamparter: For me it’s important to enjoy my dancing. To show that I love to dance and to make clear why am I dancing – what is the reason, mood, idea or story behind my dance – Is it love? Is it anger? Is it fear or is it joy? I’d like to make the spectators understand and make them enjoy watching ballet. 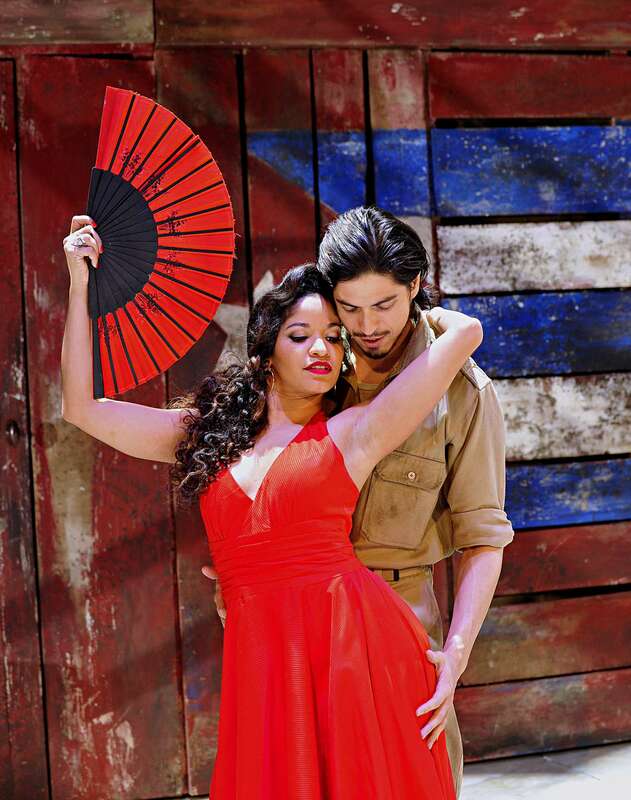 For me it is important to have the right technique but at the same time to demonstrate the choreography according to the role or style of the piece that I am dancing, and to show emotions and make people feel touched. 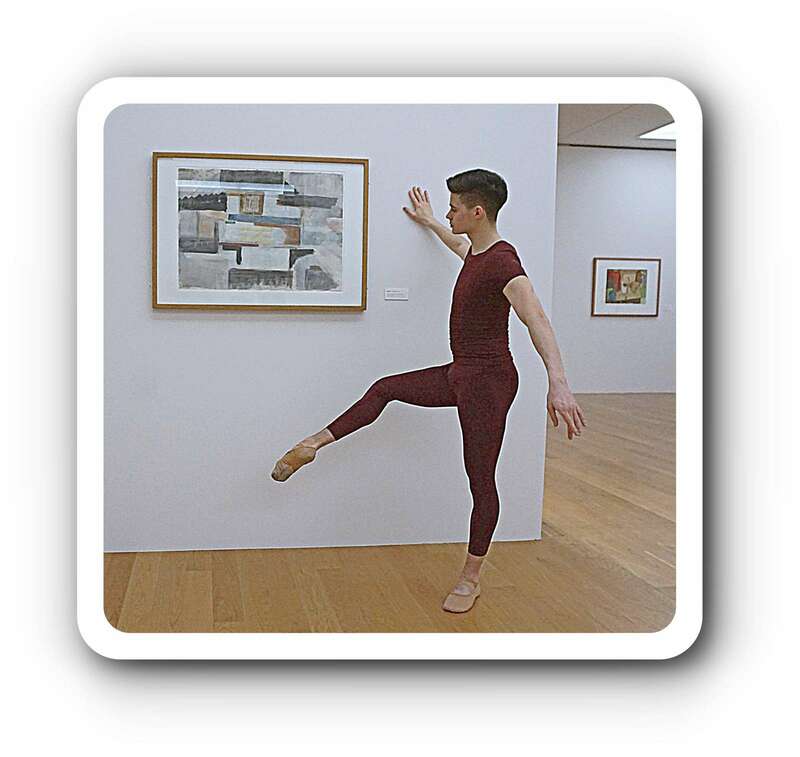 Ballett-Journal: Obviously the exhibition with works of Dieter Goltzsche inspired you. Can you tell me why? Václav Lamparter: I like both – abstract and concrete compositions. In many works of Dieter Goltzsche I found interesting balance in between. Concrete elements support an idea and abstract parts, with help of fantasy and imagination, represent everyone’s different story behind the picture. 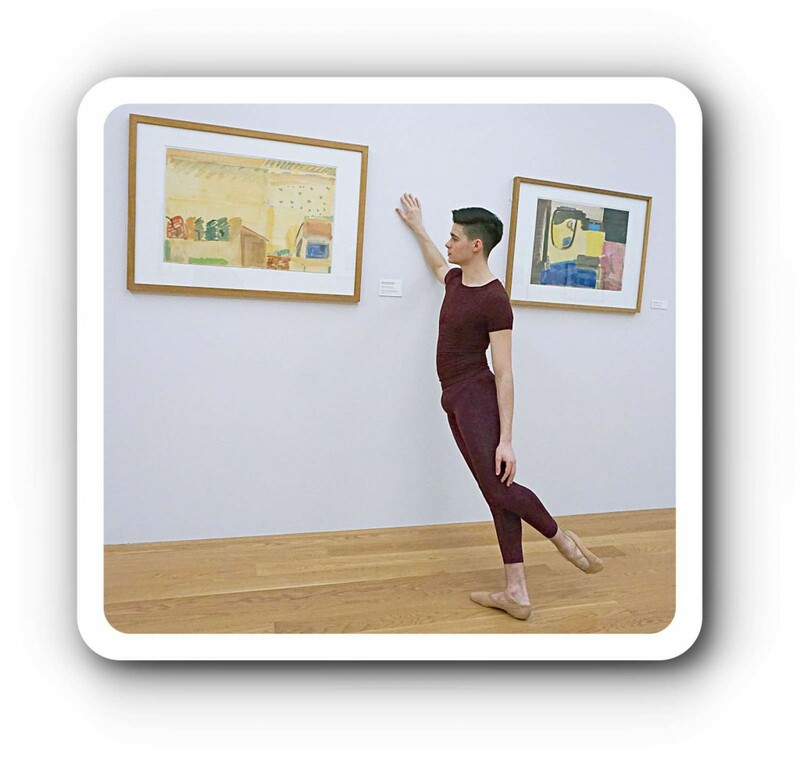 Ballett-Journal: What does art and what does dance mean in your life? 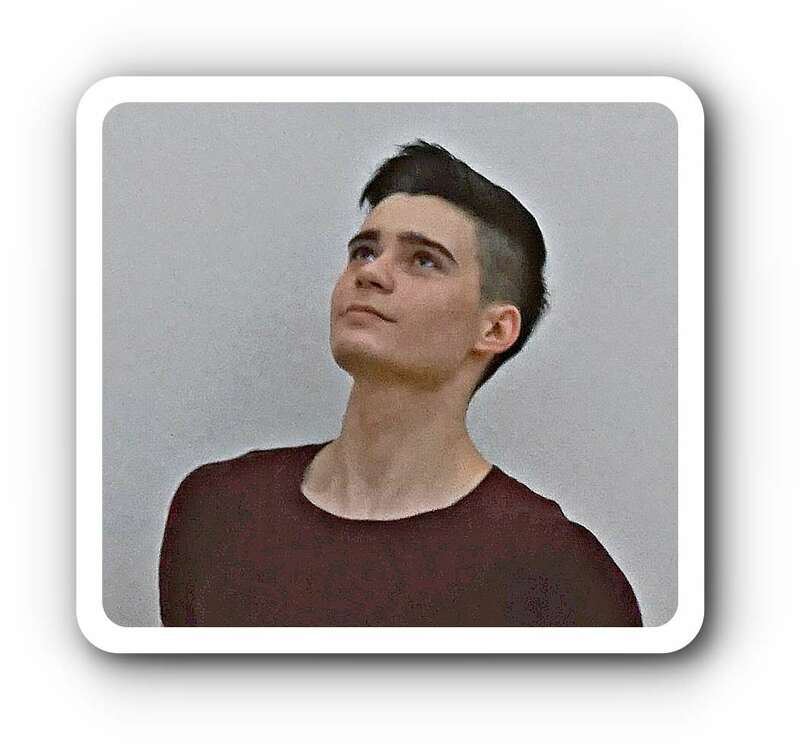 Václav Lamparter: Dance is part of my everyday life. It has become a natural thing to do for me and most of the time I don’t really think about it anymore and I just dance and feel comfortable. Dance is the hidden language of the soul. 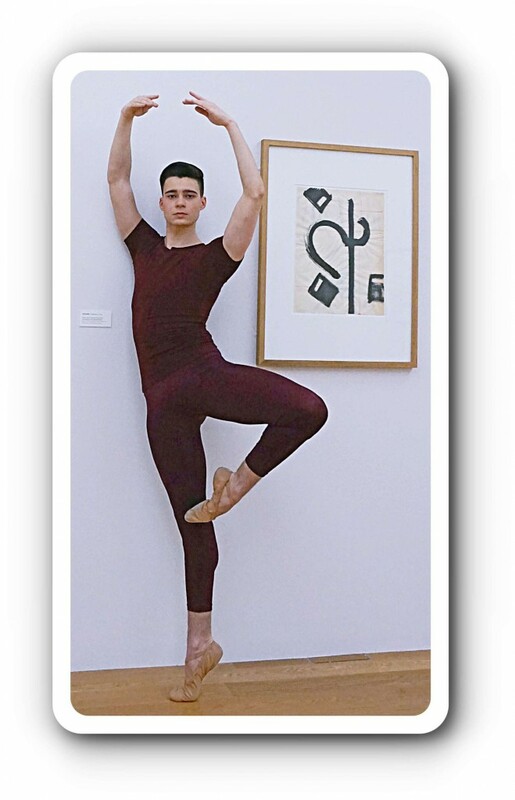 Ballett-Journal: You have so beautiful proportions. 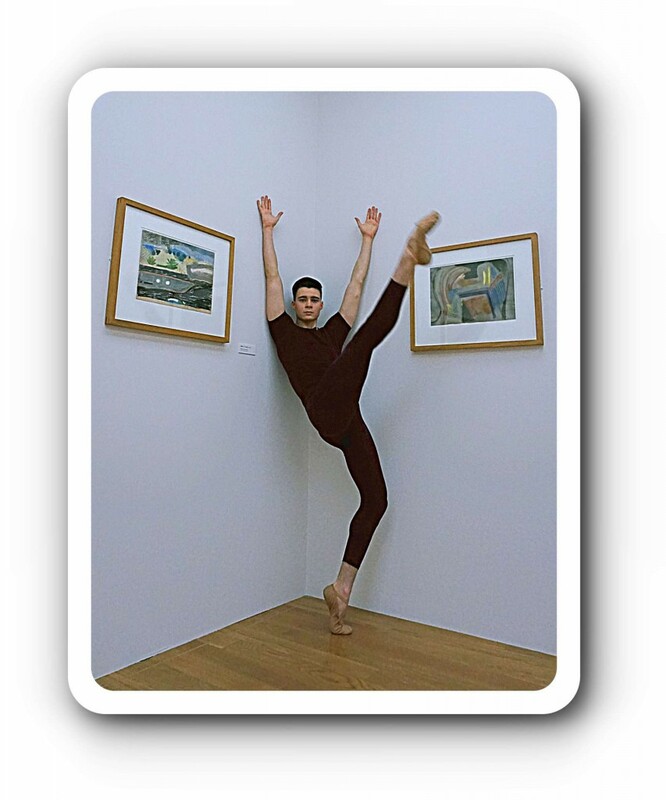 When you posed in the exhibition, did you feel somehow like a masterpiece of art? 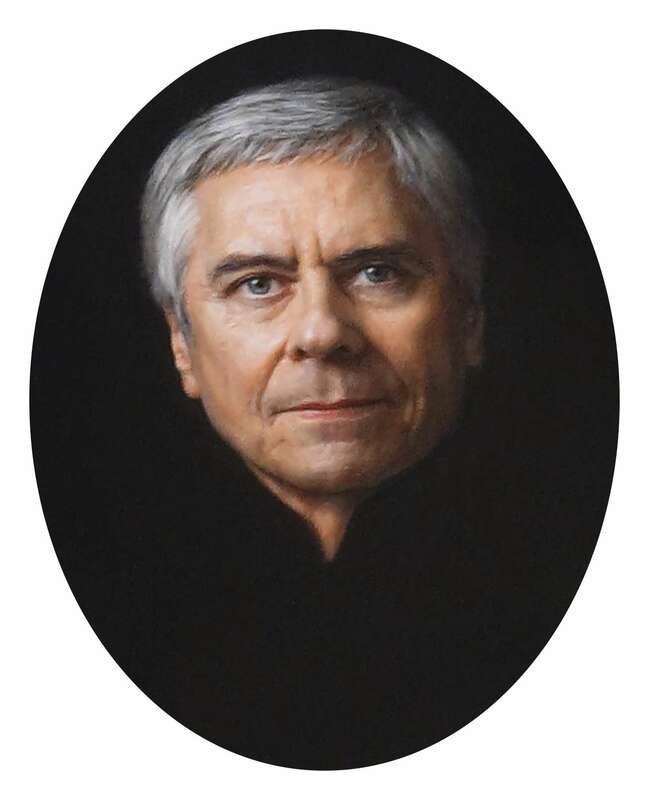 Václav Lamparter: I like the idea of connecting two or more artistic divisions together into one combined artistic expression. 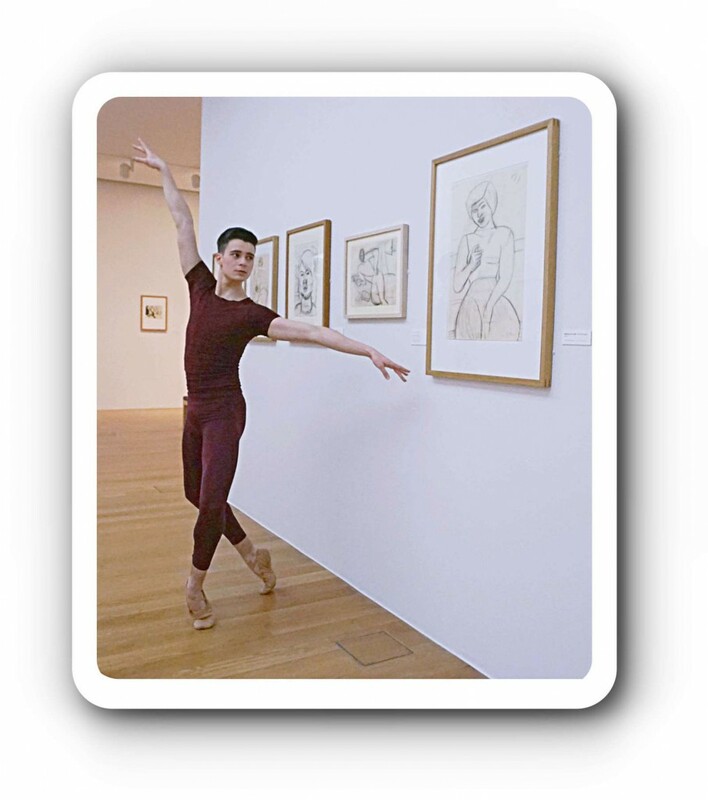 For example, dance as performing art and fine arts works really well in my opinion – for example ballets like Leonid Yakobson’s „The Kiss“ inspired by Auguste Rodin sculptures or Patrice Bart’s „La Petite Danseuse de Degas“. 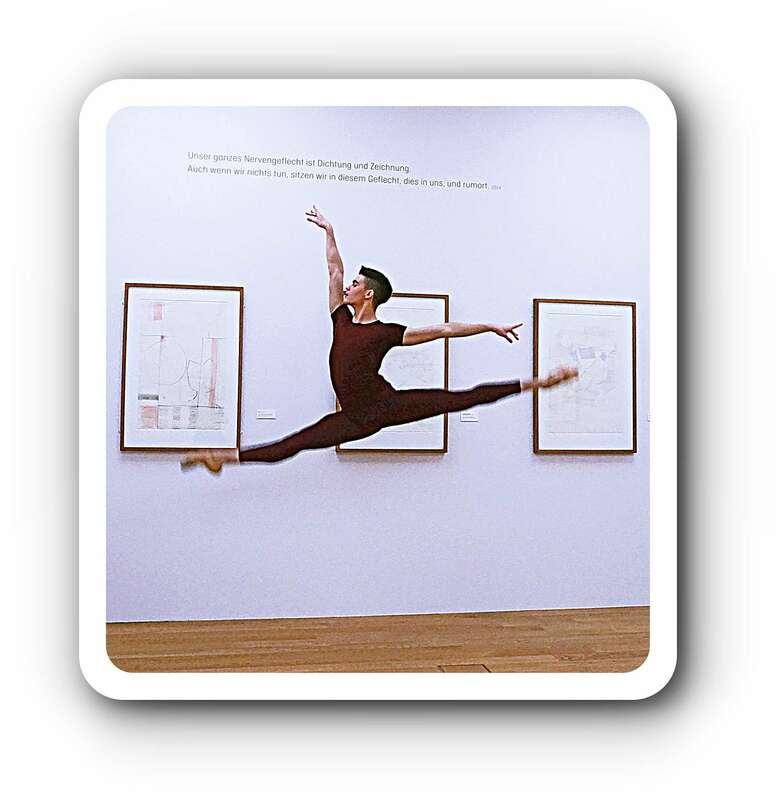 Ballett-Journal: Freedom is such an interesting word for every artist. Could you please tell me, if or how you feel free when you dance? 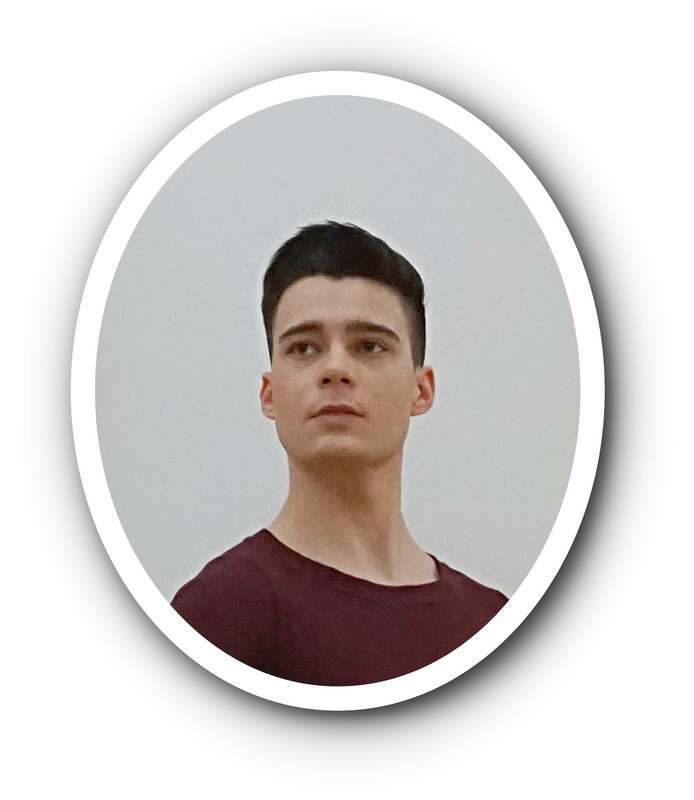 Václav Lamparter: I feel free once I have completely learned all the steps of the choreography and practised their musicality and counts. Then I can more focus on real dancing and connecting steps, and let myself be carried away by music and feel free. 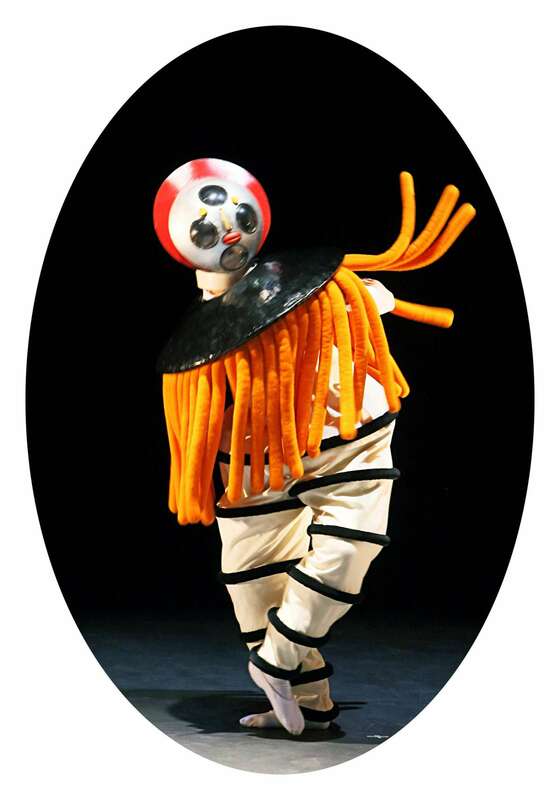 Ballett-Journal: As a very talented body artist you can be a symbol just by moving. Are you satisfied with your body as your instrument? 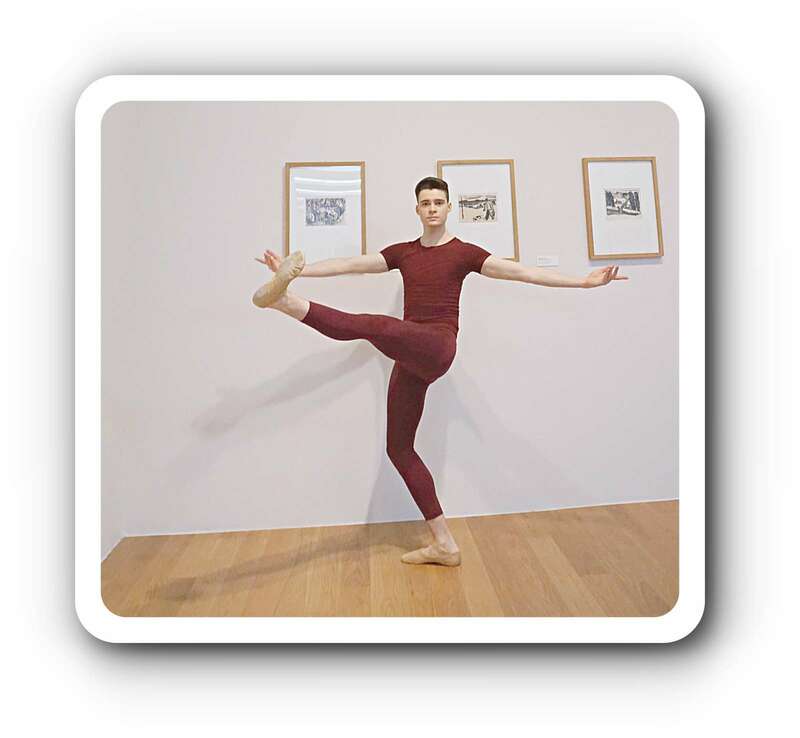 Václav Lamparter: Ballet but also other art forms are disciplines having two sides. On one side is the goal of achieving perfection – to master the artistic craft to it’s perfection. But on the other side – perfection doesn’t exist. 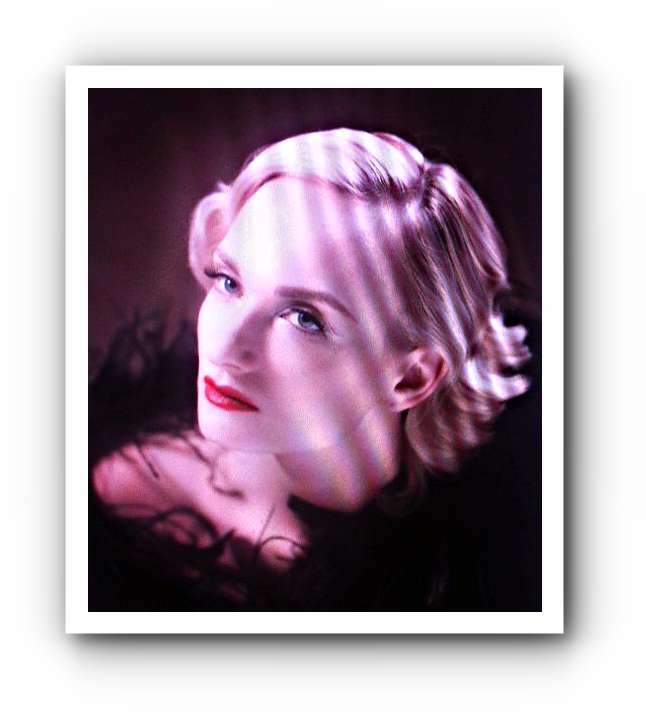 What is the perfection and how do you judge art? No one is perfect. And a true artist should be never satisfied but rather willing to improve. I think I have never met anyone who would be 100% satisfied with the body. I am also not. But on the other side I am thankful for what I have and try to make the best of it that I can. 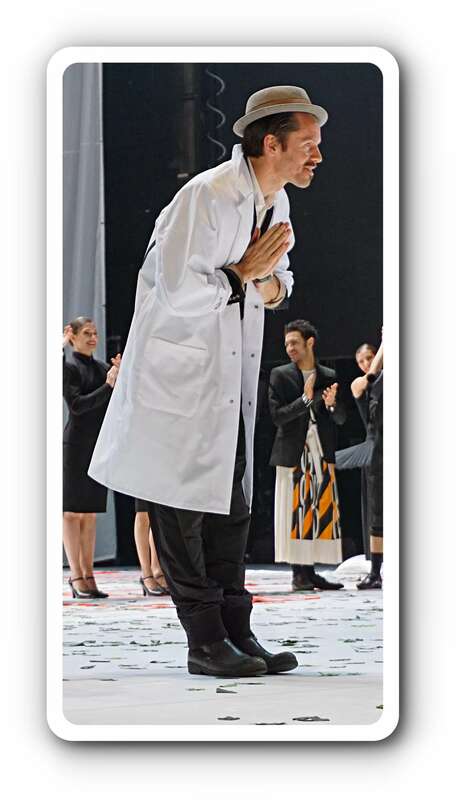 Ballett-Journal: You changed from Brno to New York for a stipendia. How did it feel like? Václav Lamparter: I first visited North America thanks to the scholarship that I got in „Vancliffen International Ballet Competitions“ in Bergamo, Italy in 2011. 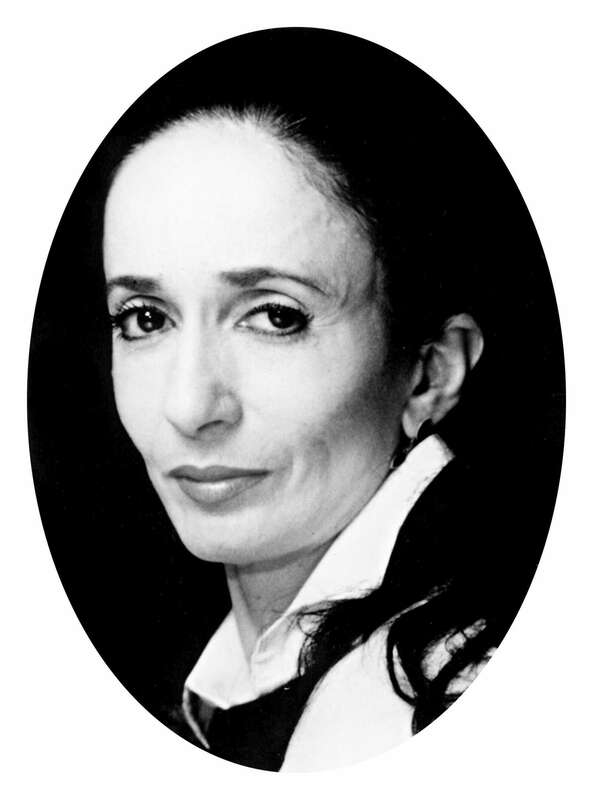 I attended a Summer School at Canada’s National Ballet School in Toronto at age of fifteen. That was an eye opener for me. This school has one of the best facilities for ballet around the world such as beautiful large studios, swimming pool, vast library, theater with it’s own costume shop and even dancer’s clinic inside the area of the school building. 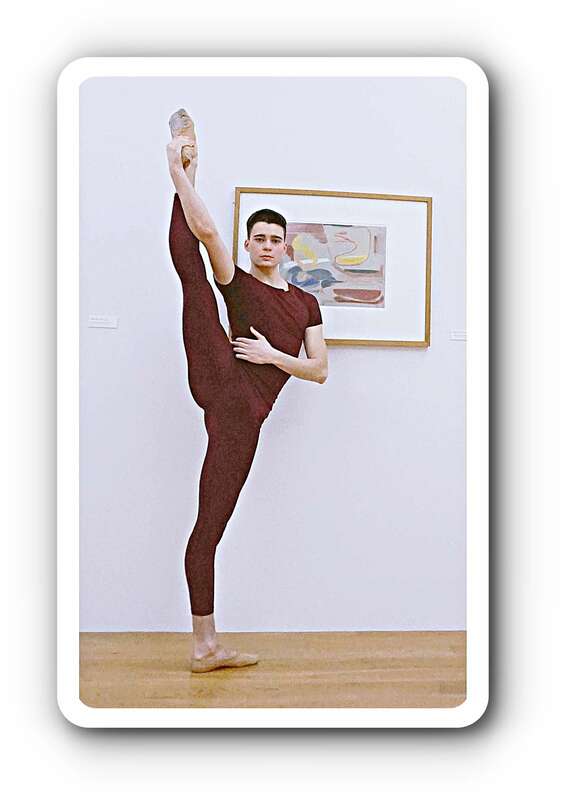 After that I visited America a couple more times before joining American Ballet Theatre Studio Company thanks to the stipend that I won in finals of Youth America Grand Prix in New York 2013. Because of that I knew a little bit what to expect when I moved to USA. The change was not that big as if I have never visited America before but I still discovered new things. 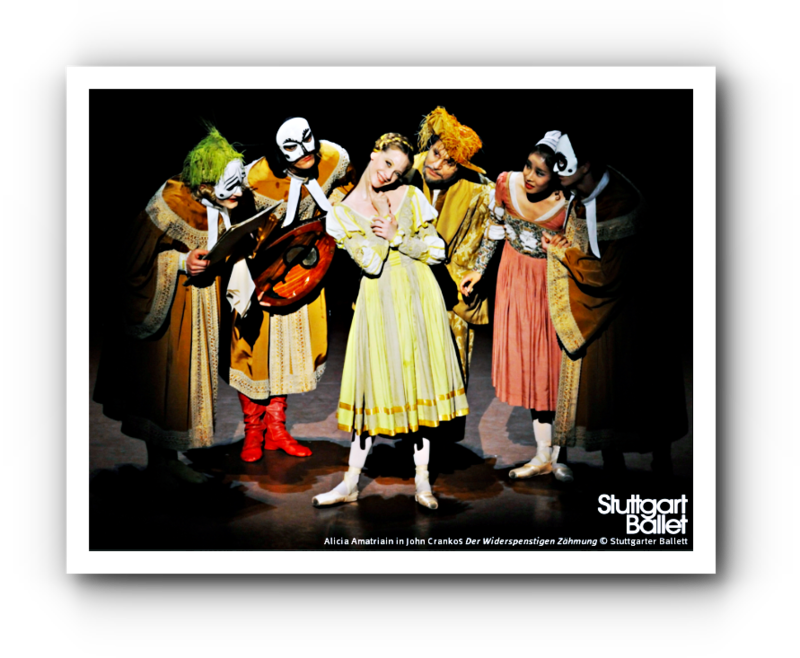 Ballett-Journal: Did you have favorite teachers in your life? Why? Václav Lamparter: I never had only one favorite teacher. 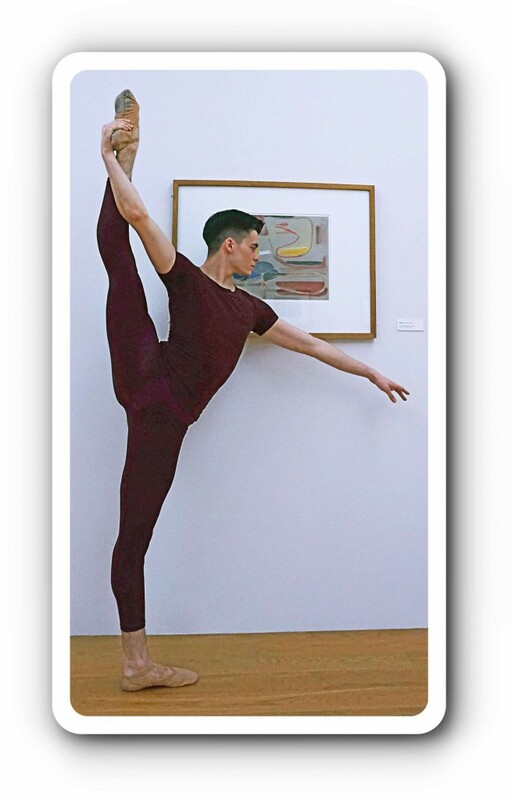 I think it is important to have the possibility to try different teachers because like that dancer can learn more. Every teacher sees different things and has different approach. Dancers should have the ability and freedom to take and absorb what is the best and works the best for him or her. Ballet is such an individual thing and every dancer is special. Ballett-Journal: Could you imagine becoming a teacher some day? 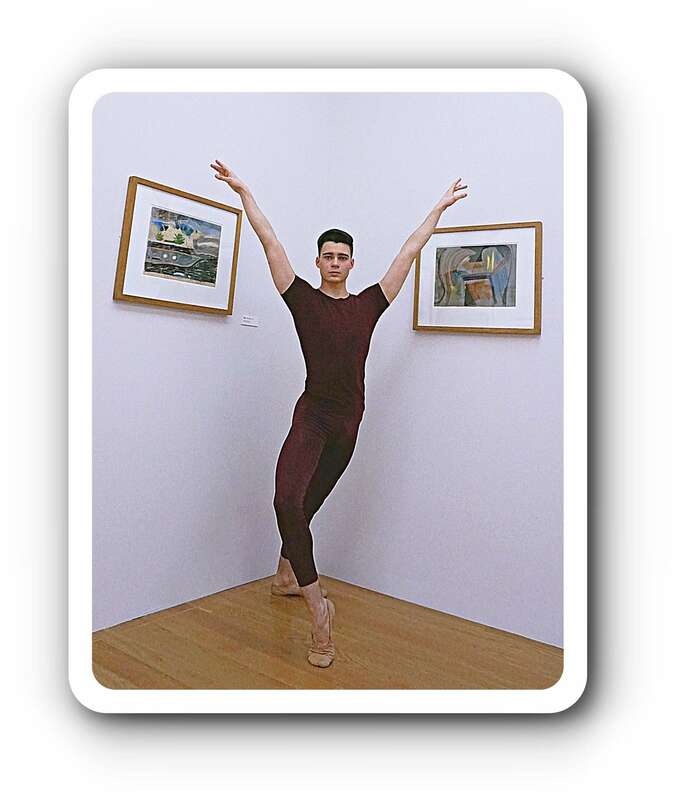 Václav Lamparter: I attended the American Ballet Theatre National Curriculum Teacher’s Training Program and received a certificate for teaching all levels. 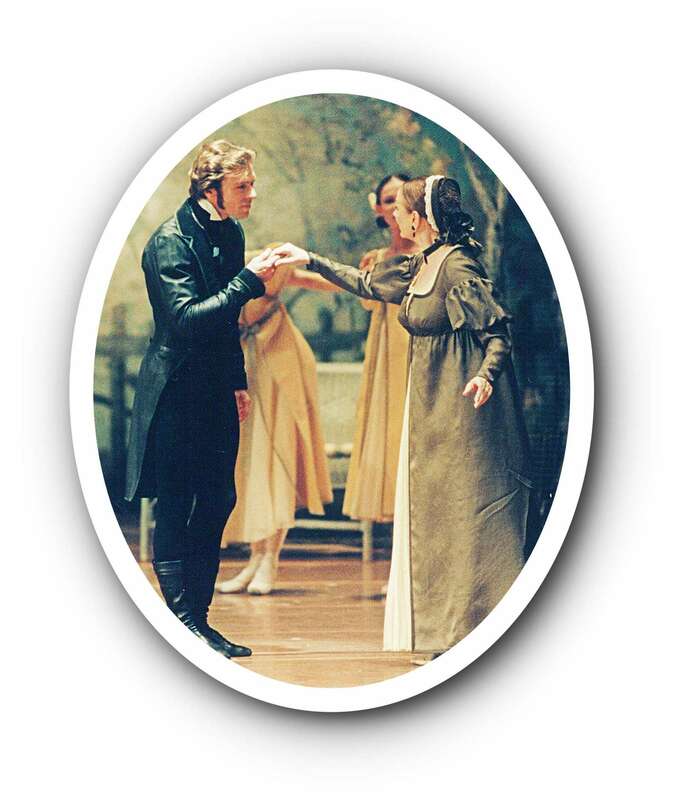 Also at conservatory I had subjects such as Pedagogy of classical ballet, modern dance and character dance so technically I should be able to teach. But to be a great teacher it’s important to have an experience with dancing and teaching. But the most important is to have an ability to pass on the students the right habits. Time will show me what is the right thing for me to do in future. I think that teaching can also improve the teacher’s own dancing. 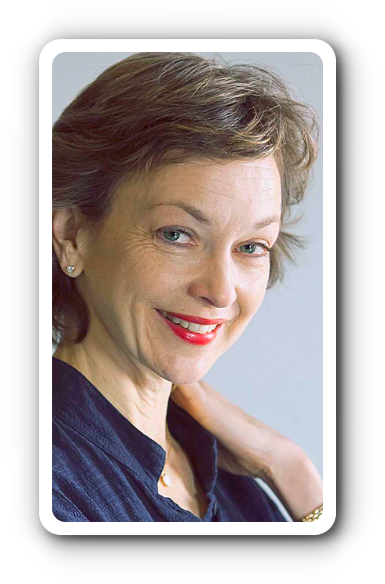 Ballett-Journal: Do you have a dream role? 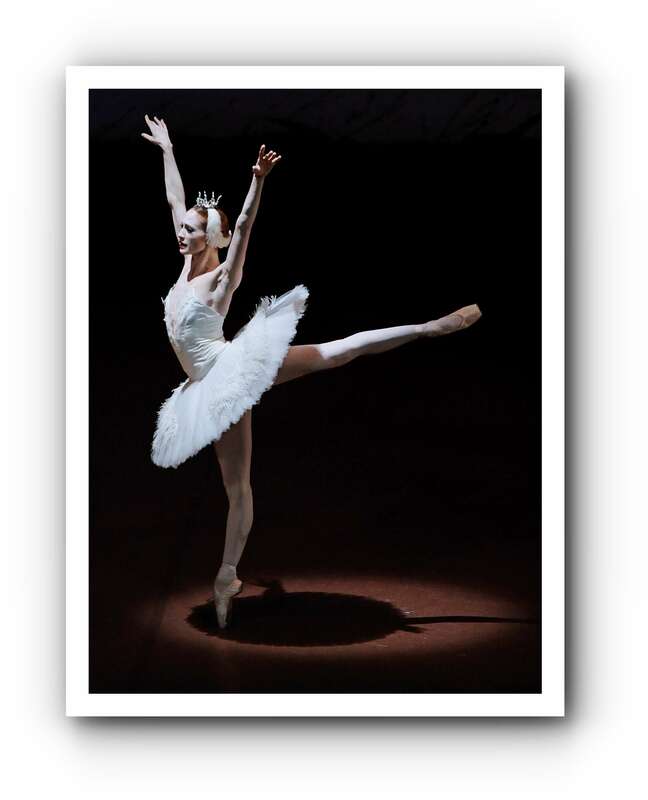 Ballett-Journal: When you first danced the title role in „Nutcracker“, how did it feel? Václav Lamparter: I felt really happy. I was fortunate to have a wonderful and very helpful partner Chantelle Kerr who made for me everything smooth and easy. 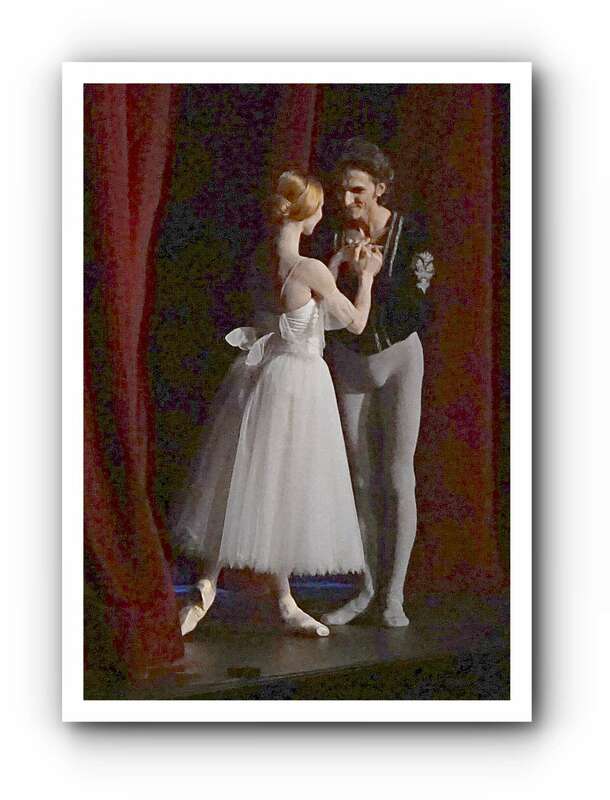 It was my first principal role as a member of professional ballet company and it was a great experience. I felt supported by everyone around me. 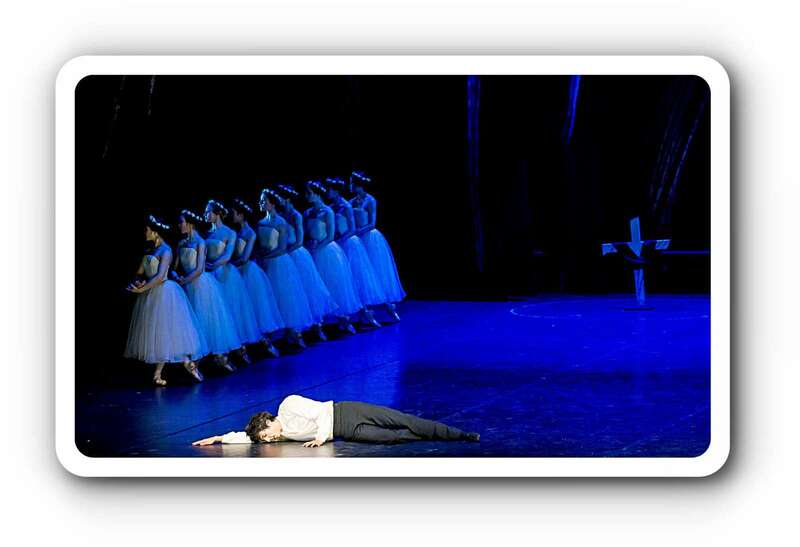 Sometimes I am sad when we don’t have many shows of a ballet that we as a company rehearse for very long. But I was very lucky with „Nutcracker“ since I got (thanks to the cast changes) five shows of the Nutcracker Prince instead of planned three. Ballett-Journal: You are such a charming person. Is it sometimes hard that you never can be lazy but always have to work very hard day by day as a dancer? Václav Lamparter: It is hard, of course. But I know that if I did something else (though I have no idea what else would I do) I would feel very bored and would miss pushing my body. There are some days when I really don’t feel like working but I know that if I force myself and try to do the best I can after I will feel better and sometimes even more energetic than before. Ballett-Journal: Injuries belong to dancer’s daily life, too. Are you afraid of that? 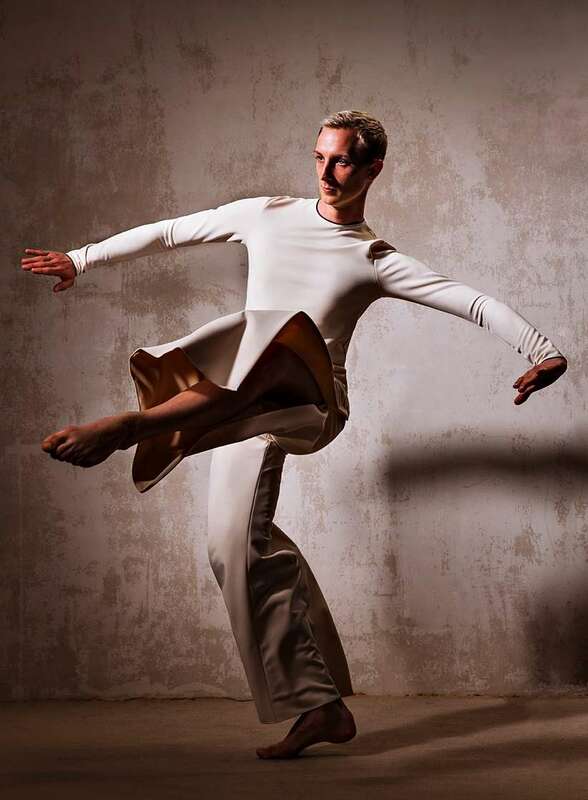 Václav Lamparter: I am aware that injuries and body pain are part of dancer’s everyday’s life but I’m lucky to have never experienced serious injury. For me as a rehabilitation from dance work well different kinds of cross training. I’m going to the gym and I’m doing pilates, gyrotonic and swimming. 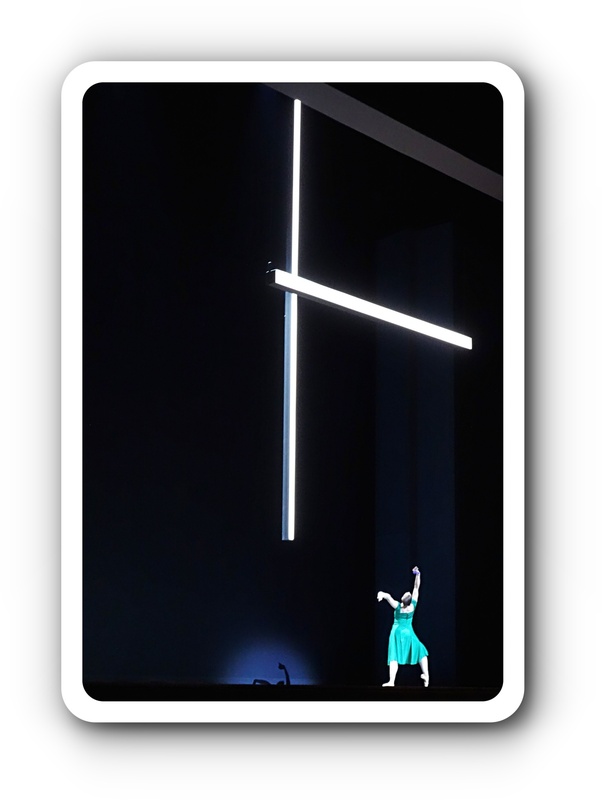 Ballett-Journal: When you came to Dresden you had both experiences: Eastern Europe and the USA. Is Dresden somehow like a mixture of both? Or is Dresden something else, with all it’s baroque sweetness and sensuality in street life? Václav Lamparter: My hometown Brno and in general Czech republic is rather Central Europe than Eastern. I was also born long time after fall of the socialism so everything has changed. But USA is for sure different than Europe. Almost two years ago I moved from busy New York to calm Dresden. I enjoyed New York life and it’s unique multicultural society very much but I also like how relaxing Dresden is. I love to pass by Elbufer on everyday’s way from the Semperoper to my flat. It’s very nice to go and relax there when it’s nice weather. It really cleans up my head and regenerate my body and mind. 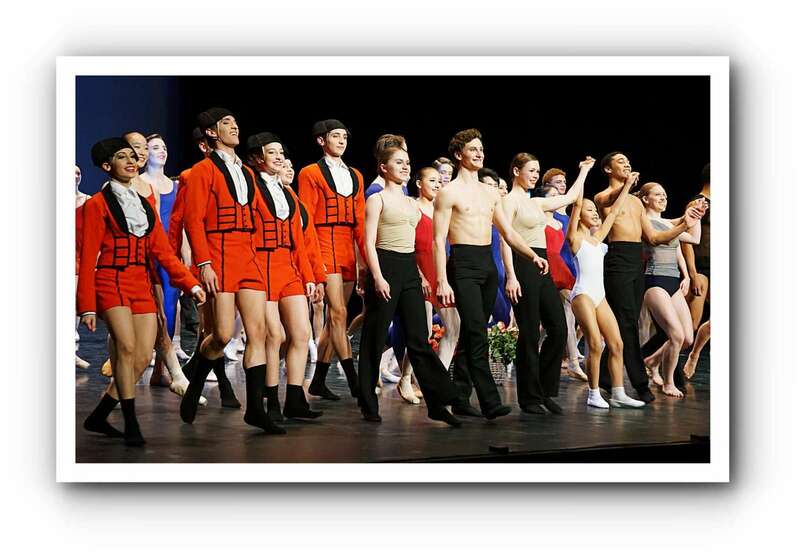 Ballett-Journal: Do you miss Brno or New York sometimes? Václav Lamparter: Maybe sometimes I miss some things a little bit but I think that in general I’m the kind of a person who lives for present. I rather look for the future than to look into the past, although I have some very nice memories. Ballett-Journal: What is important in life anyway? Václav Lamparter: It is important in life to be healthy, happy and to be thankful for what you have. To like your job and to do what you like, what is fulfilling you and to know how to enjoy it. It’s important to think and stay positive and surround yourself with good people. 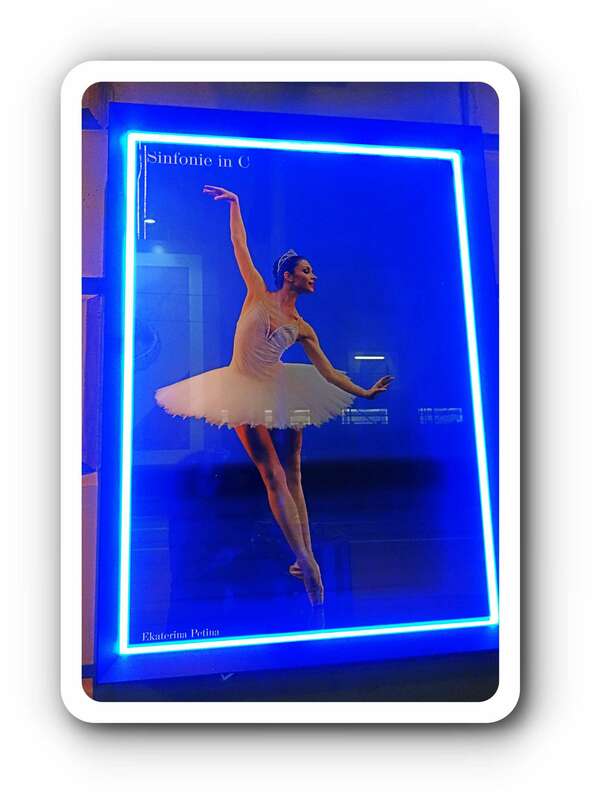 Ballett-Journal: As a ballet dancer you live between tradition and future. What do you enjoy most? Václav Lamparter: I like both. For me it’s important to respect the tradition and achievement of the past. To learn from it to bring an even more evolved and refined product. Ballett-Journal: Do you like choreographing by yourself? Václav Lamparter: I have never really tried choreographing but always when I hear a music I have an idea and steps or even their combinations projecting in my head. 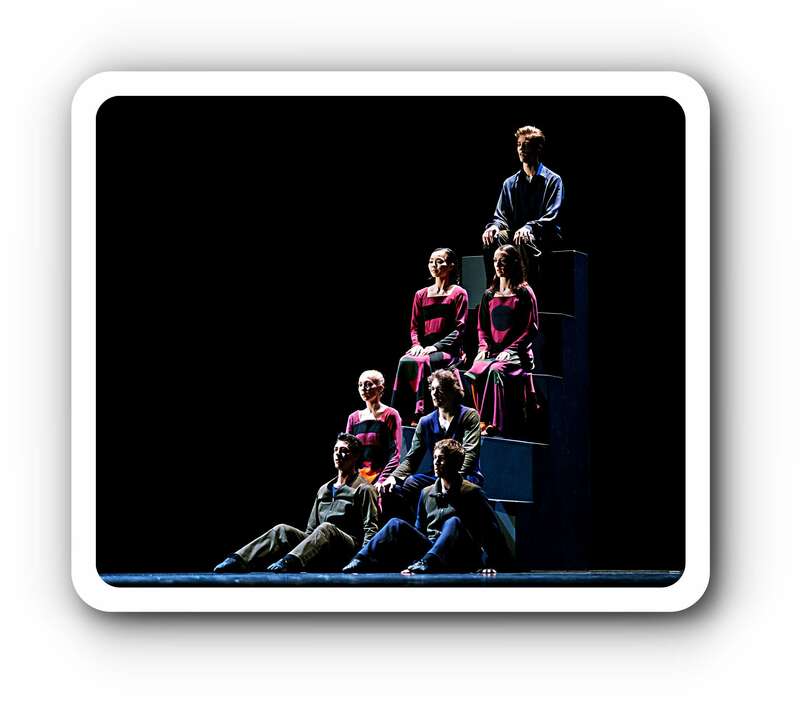 Ballett-Journal: How is the relationship to other dancers? It is always kind of concurrence and partnership at the same time, isn’t it? 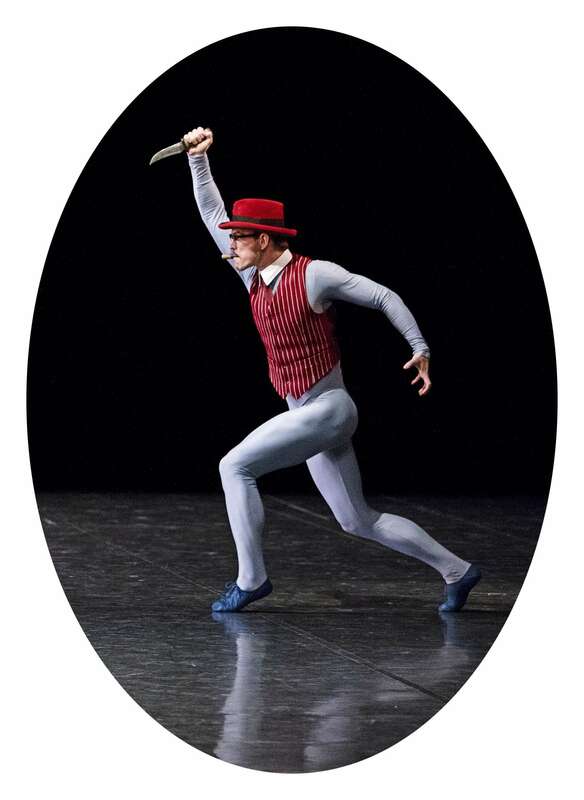 Václav Lamparter: Ballet world is very competitive – yes it’s true. But mostly in different ways than movies with such a stories like Black Swan and others. The ballet environment is often horrifyingly dramatized mostly because of it’s double-sided fact – behind its grace is very hard work and hours of pushing dancer’s body physically but with the same force ballet is (and dancers are) also pushing them(selves) psychologically. I think that more than inside the companies there is a bigger competition between dancers who want to get into a ballet company. 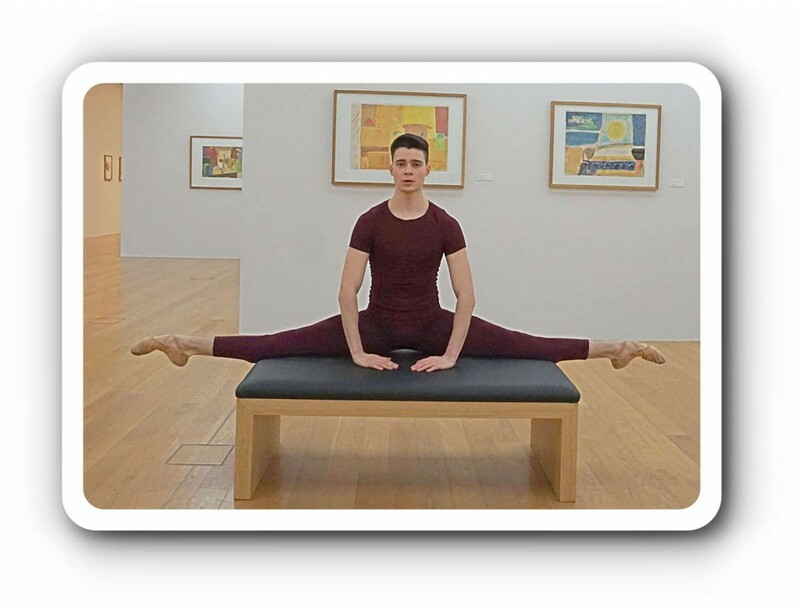 Most of the time only few top graduating students of ballet schools find a job. 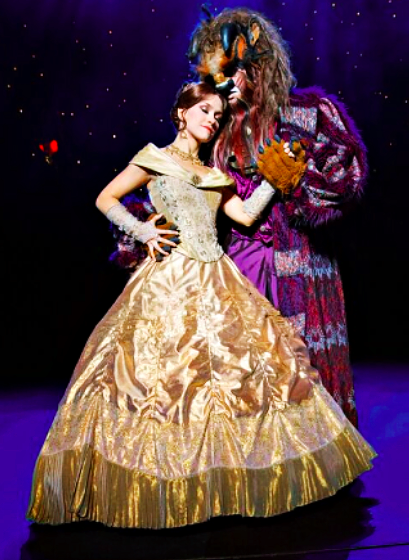 Often hundreds of dancers are auditioning for one company contract. 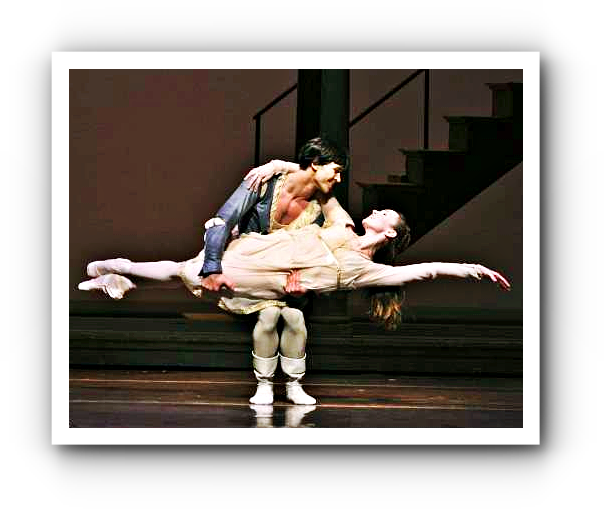 I felt very lucky when I joined Semperoper Ballett. Everyone in the company was very friendly and helpful to me. It was very easy to start a new life here. 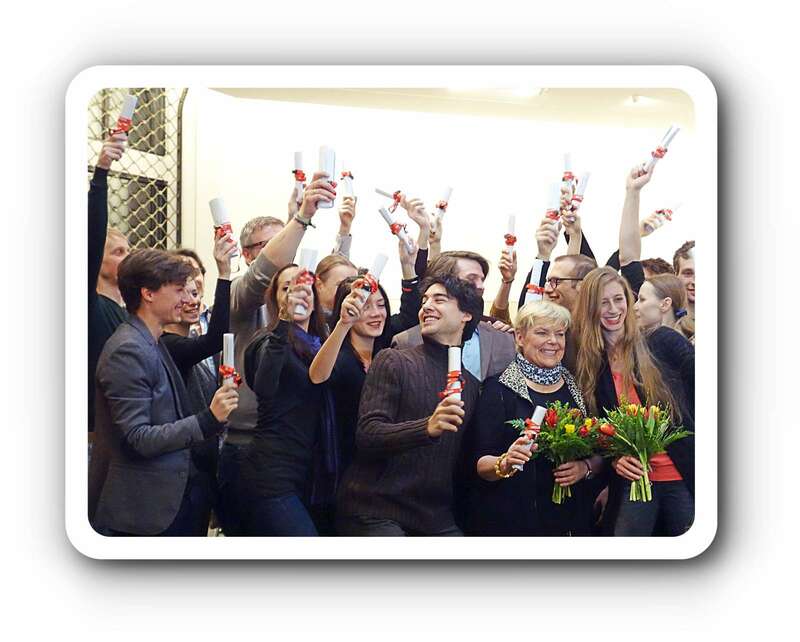 Ballett-Journal: What is most important in a company? Václav Lamparter: I think that it is very important to work as a company. Of course, there is also a healthy competition and everyone wants to do their best and it’s also important to have an individuality. But in the end we all want the show to go well and to bring for the spectator the best product we can and it would not work without collaboration. 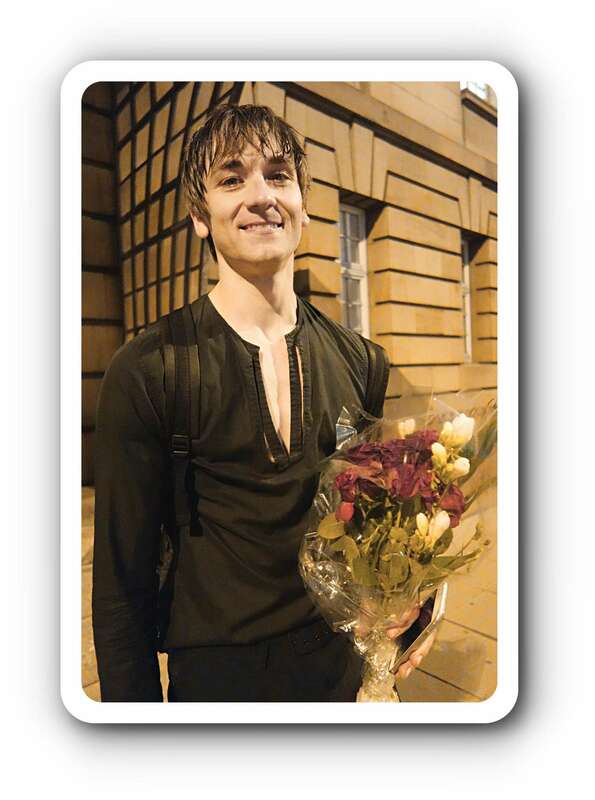 Ballett-Journal: Why did you choose Dresden and Aaron S. Watkin as your ballet director to come? 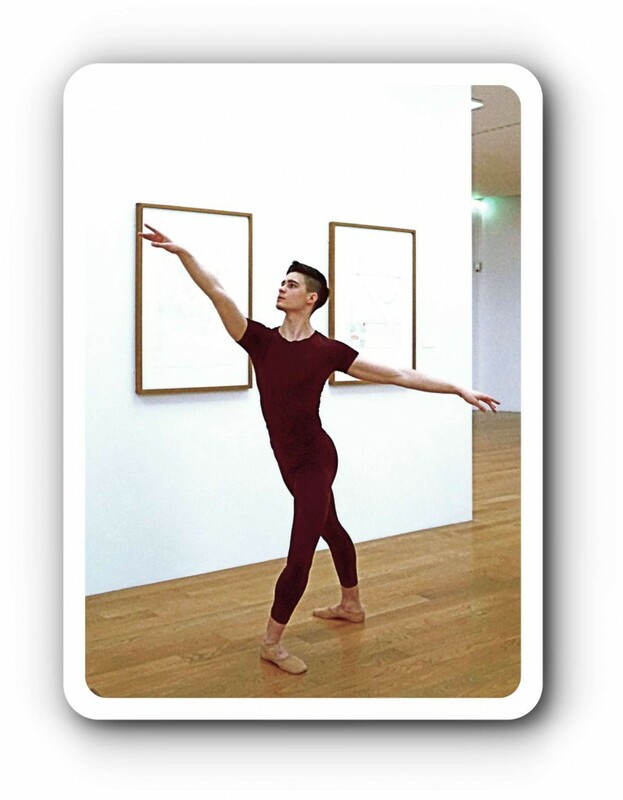 Václav Lamparter: I attended International Ballet Summer School in Dresden 2012 and 2013. 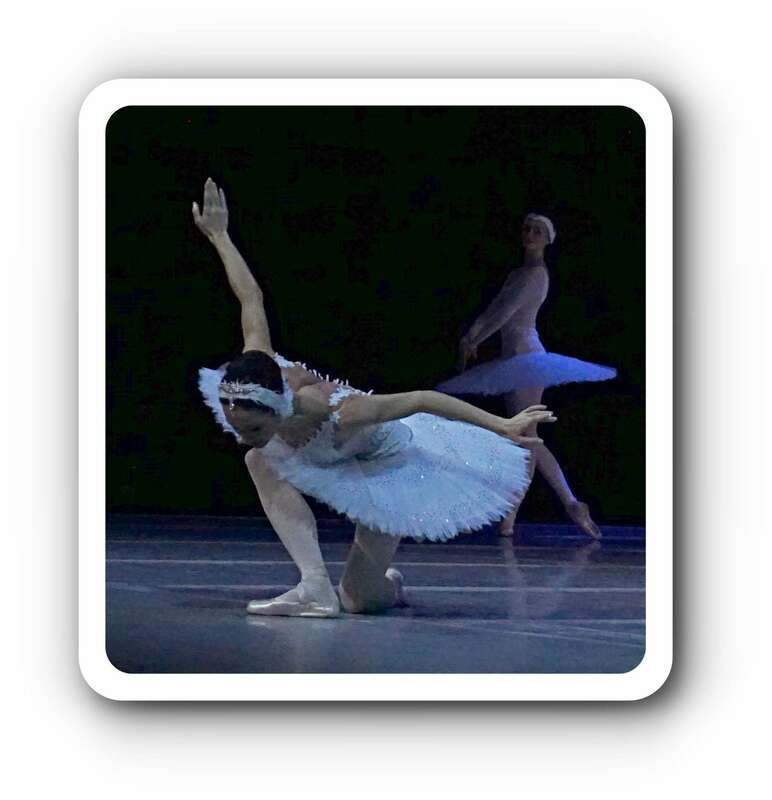 I had an opportunity to see the company rehearse and perform „La Bayadère“. I was very impressed with the level of dancing and I loved Semperoper building and the city in general. I was offered a corps de ballet contract when I was 18. 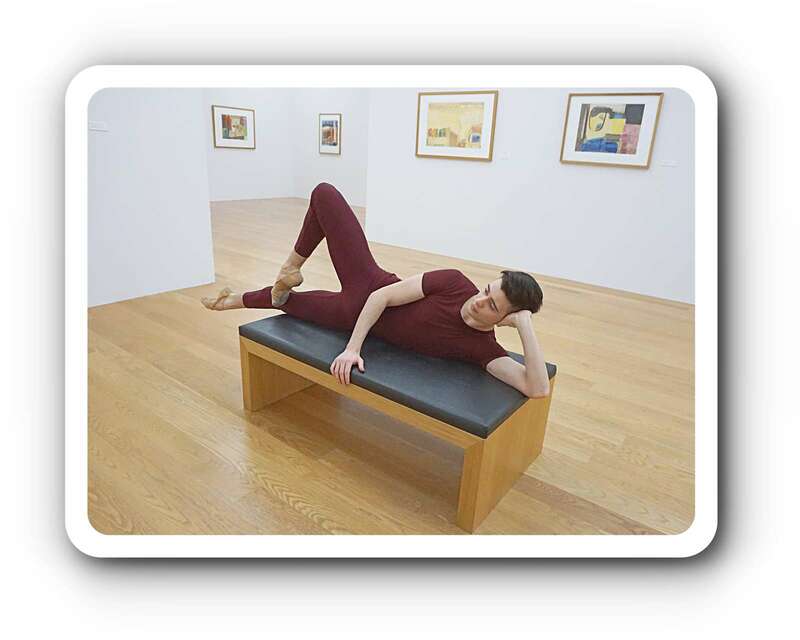 I like very much the opportunities and diversity of company’s repertoire and of our dancers. 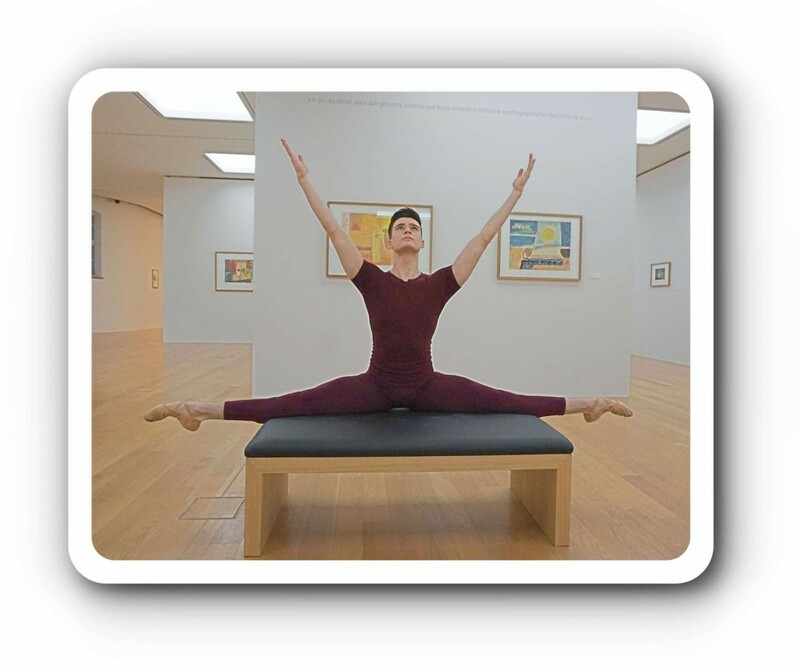 Ballett-Journal: What does the artist think of the audience? Isn’t it a relationship to help each other? Václav Lamparter: On one side there are ballets which require no interaction with the audience and sometimes even require to pretend to play or dance as if there was no audience. But there are also works that make the audience to be part of the piece. Audiences can make the artist nervous but can also support him and make his performance better through the adrenaline. 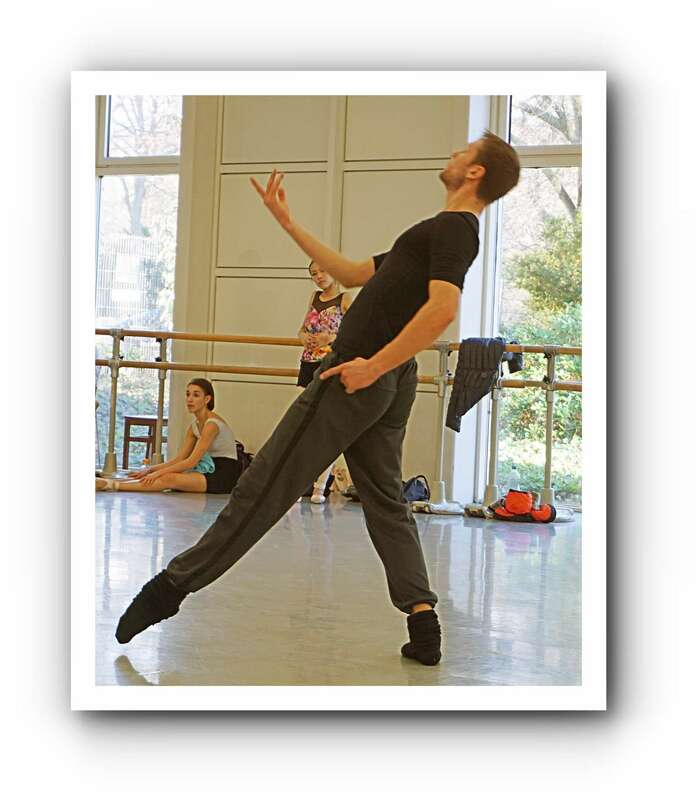 From season 2017 / 2018 Václav Lamparter will a Coryphé in the Semperoper Ballett. Congratulations! 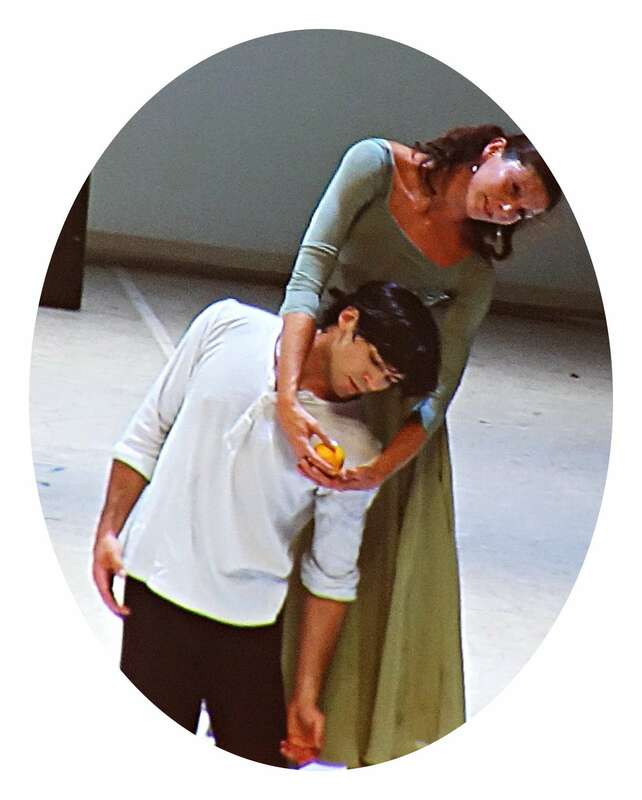 Ab der Spielzeit 2017 / 2018 tanzt Václav Lamparter als Coryphé im Semperoper Ballett. 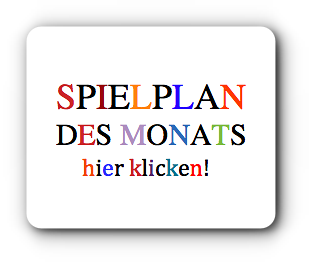 Glückwunsch zur Beförderung! 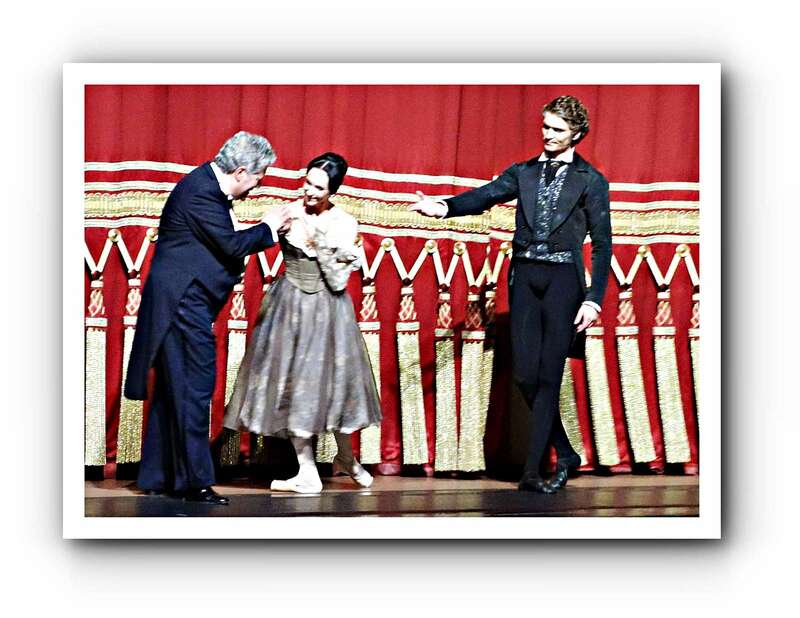 And several performances with Semperoper Ballett! Mit großem Dank an Václav Lamparter, Dieter Goltzsche und an die Städtische Galerie Dresden!